Maa Lakshmi is going to bless you, which means that wealth will constantly flow. However, due to her flighty nature, she is not planning to stay with you long. Therefore, you need to keep a control over expenses. You will have to put efforts to keep a control over your expenses; otherwise this might lead you to stress to some extent. Your honor and respect will rise in society. Meeting with big noises will be fruitful for you. By the grace of Maa Lakshmi, you are going to get happiness related to family and offspring. Some of your expenses might be related to some spiritual deeds. Blessings of Maa Lakshmi are going to shower on you during this time. You will be able to save well due to the invention of new income sources. You will also get name and fame in society. There are chances of getting new responsibilities and promotion at workplace. Tasks initiated by you will be successful. You will take an active participation in spiritual and social activities. Don’t overload yourself with heavy work; otherwise you might have to face some health issues. There are possibilities of some family issue related to wealth. You should try to deal with such issues using intelligence. Planet transit on the day of Diwali is signifying that this year you are going to receive financial success in most issues. However, time to time ailments might give you stress and anxiety. However, you will still remain balanced mentally as well as physically and will keep on fetching success as well as respect with your hard work. Some of your expenses could be in pious deeds. Maa Lakshmi could suggest you some travels this year. Therefore, these travels will bless you. 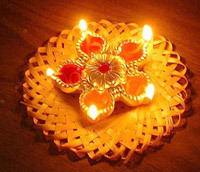 Diwali of this year has brought blessings of Maa Lakshmi for the people falling under Cancer sign. You will get new sources of income. Your financial situation will become stronger. You will get success in business. Service men will get promotion at work. However, workload might increase. You will achieve respect and honor in society. Generally, you will stay happy and mentally satisfied, but due to the conjunction of Saturn and Moon on the day of Diwali you have to take special care of your health. This Diwali, Maa Lakshmi is going to bless you with such a thing that you are going to make good contacts with eminent personalities. These contacts will further help you getting success and financial stability. With success at work, there are good chances of family peace seen. Constant progress will keep your financial tensions away. Social surroundings will also be positive. After all this too, you have to keep putting efforts constantly. Signifying light, this festival is bringing the message of eradicating darkness due to Saturn’s Sade Sati out of your life to some extent. You are going to make some new strategies at your workplace that will come out useful in future. Tasks that you have ceased due to some barriers will be accomplished now. There are situations indicating betterment in your financial conditions. Consistency in income will keep you delighted. Progress around your social circle is also seen. Maa Lakshmi will bless you this time, but not as per your expectations. Still, your financial situation will be constant. There may be a lack of consistency in income, but sudden money can come anytime. You will be fine physically, but some psychological ailments might trouble you. You might feel dissatisfied due to not receiving desired results of your hard work. However, you will be able to maintain your things with the help of senior people and government officers. Maa Lakshmi will shower blessings on you. Your financial situation will be better. Your mental strength will increase due to the inception of new income sources. However, new expenses will keep on poking in between. You will get success in work and business. There are chances of getting promotion for the ones in service. If you are unemployed, you will get employment. Unmarried people, who are willing to marry, will meet their life partner. Harmony will bless your home. Respect and honor will increase in society. Maa Lakshmi is going to bless you in such a way that she will keep on coming and going every now and then, and income will definitely come to your home, but with expenditures too. However, increment in income is destined. That is why you need to maintain a balance between earning and expending. Yes, by spending on some spiritual deeds you are going to get fame. You will cherish both family as well as worldly pleasures. Situations will be fine at work due to your hard work and dedication. Usually, your health will also be fine. This Diwali, Maa Lakshmi is going to bless you for being progressive in all four directions. You will keep on getting financial profits. Your skills will fetch you success and respect. Positivity will stay at work. Your bond with your partner will be strengthened. You will get support from government officers and royalty during this time. Your interest will increase in various subjects and fetching more knowledge. You will also feel like getting knowledge on occult subjects. Maa Lakshmi is going to be clement on you this Diwali. Luck is with you. There will be positivity at work and business, which will increase the chances of profits. There will be harmony in family. There will be progress and success in plannings. If you are willing to buy a vehicle or property, then the time to fulfill your desires has come. You might also get profits from the side of in-laws. Your hard work as well as efficiency will get you success in almost all fields. This Diwali, Maa Lakshmi is going to make you aware of some new subjects and relations. These things will definitely help you in future. There are possibilities of getting new opportunities in business. Your friends and relatives will prove them your real supporters. Travels related to work will be successful. Generally, your health will be fine. From the aspect of studying and teaching too this time is favorable. Your interest might increase in literature as well as philosophy. You will get respect and honor in society.